QUESTION 1: What do you do for a living? QUESTION 3: Can you tell me 5 random facts about yourself? It's time to think about online dating strategically. Every date you waste on someone who clearly isn’t a good fit, is time you could be spending dating someone with whom you have more in common. offer a myriad of games and quizzes engineered to help break the ice online. But still, don't even think about saying yes to a date before you vet him with these 3 essential online dating questions. Purpose: The question “What do you do for a living?" reveals much more than just how much money someone makes. Their work hours, vacations, and priorities are dictated large part by the career they choose. If his career doesn't match your personality, if the lifestyle it requires doesn't align with that which you have determined appropriate for you, if you simply can't stand what your guy does for a living, maybe he's not the one. After all, in addition to taking up his time and requiring his attention, he chose that career, he decided that he wanted to live that lifestyle, put in those hours, and spend the rest of his days plugging away doing that. This says a lot about a person and what’s important to them. When it comes down to it, sometimes the right person simply has the wrong career for you. And that is a painful realization to come to and a seemingly ridiculous little thing to end a relationship over, especially after months or even years of dedicating yourself wholly to him. But realistically, it's huge. It's your life. It's your day to day. So instead of causing yourself any undue pain, heartache or financial expenditure, really think about what career-type makes most sense for you, then worry about all of the other potential personality-based deal breakers later. How to ask it: “You mention in your profile that you are a doctor. I'd imagine that most would say that is an admirable career—which I agree with, but I'd love to know what impassioned you to become a doctor and what continues to drive you to do it?" Why ask it in this way? Because you are not grilling or interrogating a subject. You are trying to learn more about them in a conversational way. Weave your words to make your questions seem more natural. You might also want to add what you do and why. This way you are showing them what your expectations are by setting an example. It's a method known as, “I'll show you mine, then you show me yours." I'm not asking you a question. Nor am I setting up an answer. The question is: “Why?" What's great about “Why?" is that it's a question you can tack onto almost any other mundane question and suddenly transform it into something substantive and revealing. It's also a great way to communicate and even seem interesting on a date, even if you are clueless as to what he's talking about. and therefore learning if he's right for you. Remember, your goal is to find real compatibility. While many of us are people-pleasers, dating sites are not the ideal forum to meld your personality and make it work with all different types of daters. In fact, eliminating irrelevant singles, or those whose goals and lifestyles simply do not align with yours, is a crucial step in online dating. Purpose: By asking questions, you allow him the opportunity to open up, delve deeper into subjects that he might normally not talk about, and maybe even tap into a raw and vulnerable side that he isn't accustomed to exploring. 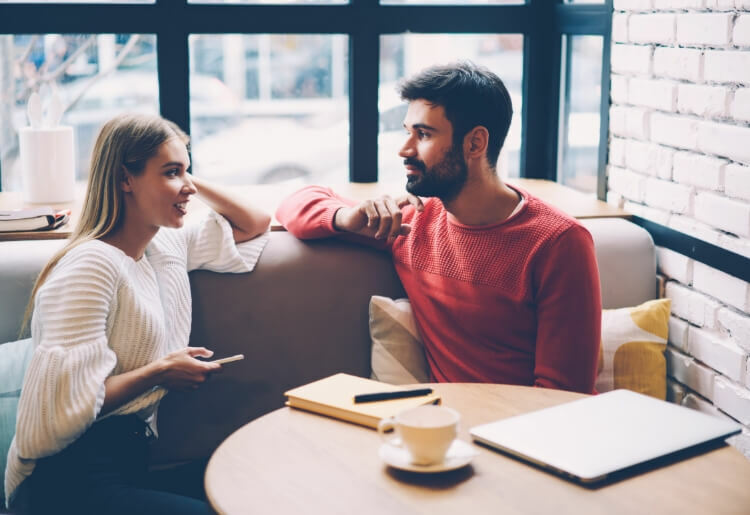 By asking “why"—in a non-threatening or patronizing way of course, you are expressing true interest—a key component to a successful relationship: Interested and interesting. You are interested in him, what he has to say, what his values, beliefs, and perspectives are. You are interested in his day, his past, and being a part of his future. And he, too, is interested in you. By asking “why?" you are able to understand the root of decisions and passions, and the impetus for his interests. Why did you decide to be an attorney? Why do you love romance movies? Why do you love photography as a hobby? Why did you decide to move from NY to LA and buy a house near the ocean? Why does your family eat tamales on Christmas instead of a traditional turkey or ham? Purpose: Unless he takes it as a joke, he will likely think about this one for a second and tell you some pretty interesting and revealing things. He may share his education, honors, lifestyle, upbringing, talents, idiosyncrasies, taste, social status, or quirks. It may also reveal things that are on your must-have or won't-stand list that will immediately turn you off or on. The answers to this question may be the time that you decide to stop responding to him, and move on, OR make you even more intrigued. Example 1- “1. No brush or comb necessary as after showering, I can throw some gel in my hair, and voila, it's ready to go. 2. I can tie a cherry stem with my tongue. 3. I'm a poor singer, but enjoy karaoke so long as it's a private room 4. I try to have a dark piece of chocolate everyday. 5. I like to dance, and really enjoy classes, but still haven't mastered free form." What I extract from his response and how it affects my decision moving forward with him: I too am a poor singer, but will consider it if in a private room (which also says something about his finances). I love that he enjoys dance classes, which shows that he is open to learning new things and doesn't mind looking silly in front of others. Example 2- “1. I lived in Japan for a year when I was 17. 2. I DJ as a hobby. 3. I don't own a TV, but I love “Game of Thrones” so I get together with a group of friends whenever there is a new episode. 4. I know the best sushi restaurant in L.A. (Go ahead... challenge me!) 5. I have a motorcycle license." What I extract from his response and how it affects my decision moving forward with him: The fact that he lived in Japan shows that he is likely well-traveled, even beyond Japan. He is willing to take risks and is an adventurer. The fact that he DJs as a hobby says that he has a fun and a party side. Not owning a TV, that is tough for me. He could be a bit too counterculture for my taste. I love sushi and I love a challenge, so that was a turn-on, I cannot stand motorcycles and that made me cross him off the list immediately. He may be a little too wild and counter culture for my lifestyle. Plus motorcycles are simply a no-go for me. Let's admit it, everyone has their deal-breakers. For me, it's motorcycles. For others, it's workaholics or wine snobs. Thankfully, match.com offers a “Deal Breakers" options, which automatically narrows down your dating pool by eliminating any potential matches whose lifestyle choices fundamentally don't align with yours. Keep these questions in mind—they are your key to online dating success. Now go test them out! Check out our top-ranked dating sites now.